Comfortable and stylish 3 bedroom top floor apartment in popular Hughenden. 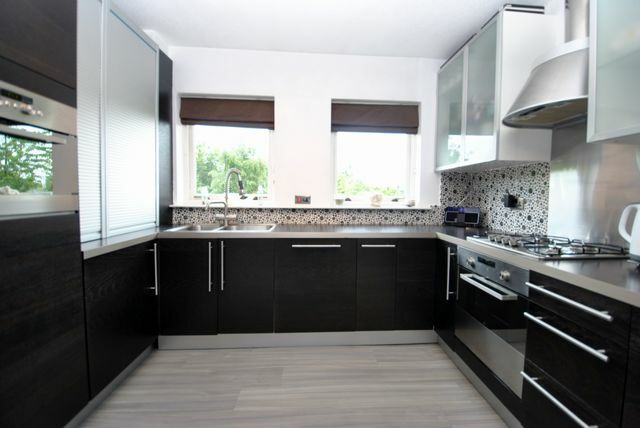 Top floor flat has great flexible accommodation for a professional family or couple. Entered via secure entry it comprises spacious entrance hall, generous storage cupboard, large dining kitchen with eating area and stylish kitchen units( fully integrated appliances- washer dryer, dishwasher, fridge/ freezer, microwave oven), spacious living room with large windows overlooking the gardens, master bedroom with fitted wardrobes and modern shower room ensuite, family bathroom with shower over bath and 2 further double bedrooms both with fitted wardrobes. All rooms have bright, double glazed windows. Well decorated throughout with quality fittings and fixtures and neutral tones throughout. Attic for storage, private garage. Communal gardens. GCH. Residents parking. Located in ever popular Hughenden Gardens, this flat is perfectly situated to enjoy quiet surroundings while being a short stroll from Hyndland are with its many bars, restaurants, deli and independent shops. Hyndland train station within easy walk offering access into town in 5-10 minutes.